Jira is an incredibly powerful tool. And some of its strengths lie in its ability to adapt to any teams unique, preferred way of working. That’s how Jira’s extensive customizability offers so much value. But there’s also a bit of a downside to that flexibility: It’s easy to get lost in all the features Jira has to offer. And getting lost inevitably leads to confusion and a decrease of your teams’ productivity. 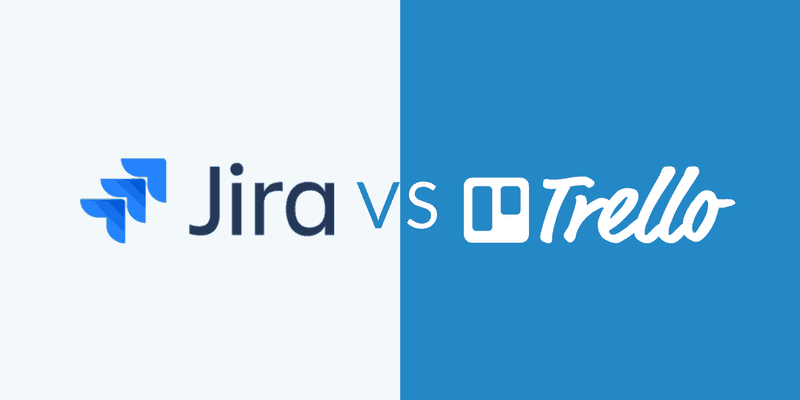 In this article I will share with you my most valuable tricks that I personally use to increase productivity in Jira. I’ll cover tips for users as well as administrators of Jira. You do not have to be an administrator to get value out of this article, but there are also some tips for administrators specifically. If you’re a user, I suggest contacting your administrator if you’d like to implement some of the more advanced tips at the end of this article. 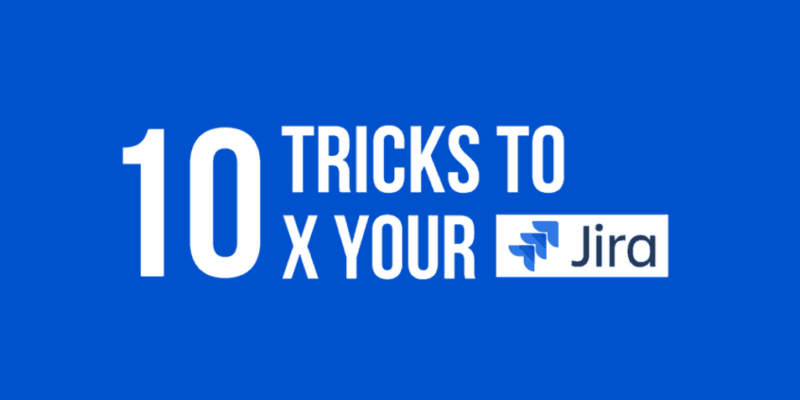 So without further ado, here are my 10 tricks to 10x your productivity in Jira. Are you struggling to get a consistent overview of your short term to-do list? You can use a filter subscription to notify you with a shortlist of tasks to complete. It’s also pretty easy to set this up. I’ll show you. Or you can use JQL in “Advanced” search mode. An example: assignee = currentUser() and due > now() and due < 2d and status != Closed. After that you can “Save as” a new filter. 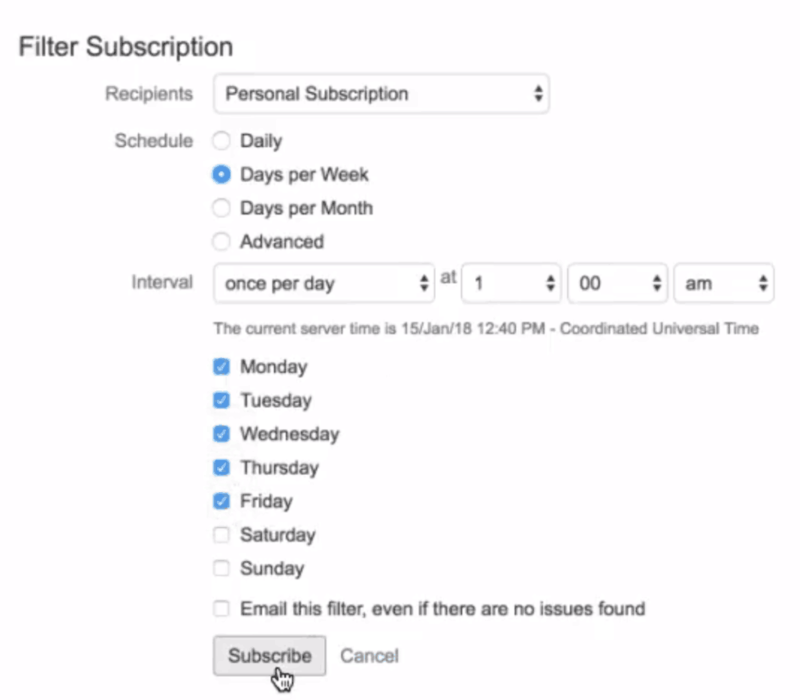 Finally, create a filter subscription to send an email when a due date is approaching. This works particularly well for recurring tasks, quarterly Jira maintenance items, or for making users inactive on their last employment day. You can create a subscription from the details page of any saved filter. 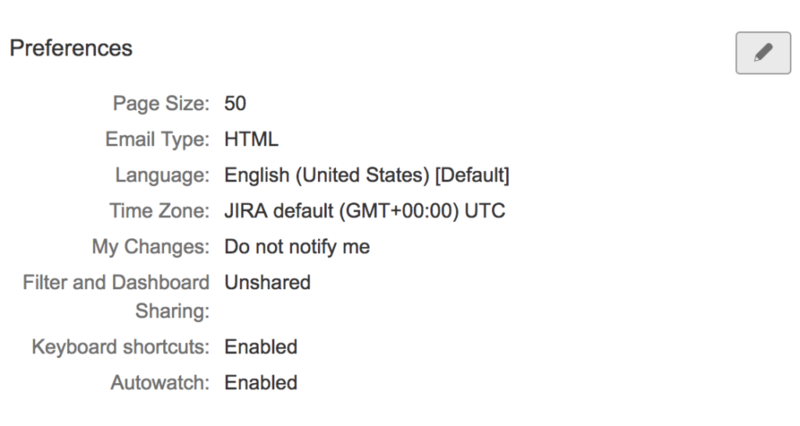 Once there, you can select the criteria for Jira notifications. For example, on weekdays and once per day. Voila, you’ve subscribed! Now you should receive notifications directly to your inbox. A good way to increase productivity is to decrease the amount of clicks required to reach a destination. 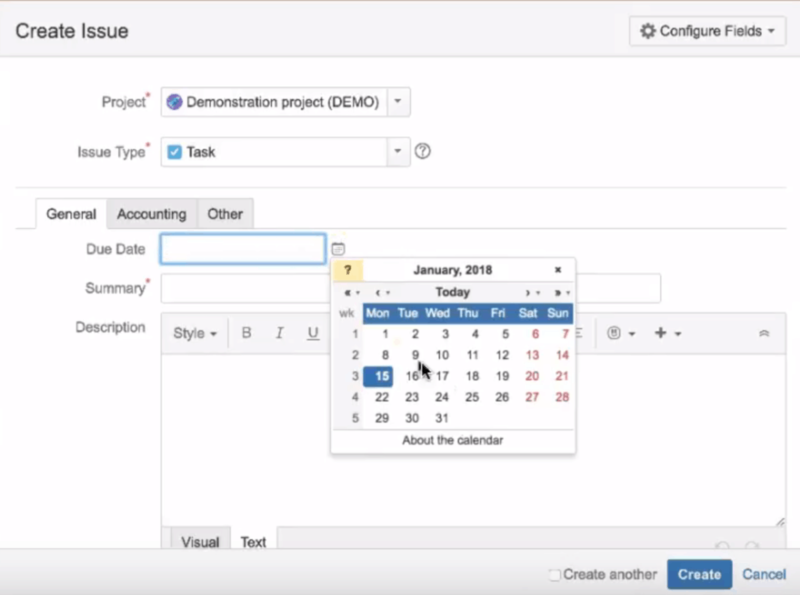 End users and administrators can use the “Search engines” browser feature to quickly jump to Jira projects, issues, and pages. No navigation or clicks required! Adding this browser functionality is easy. 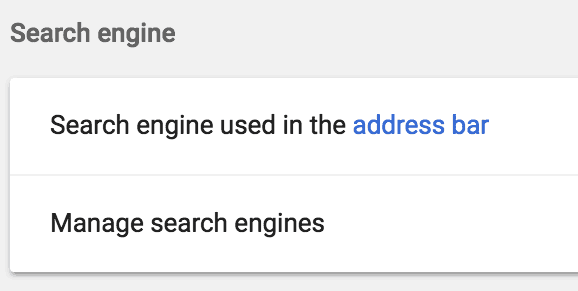 In Chrome, add a custom search engine by clicking > Settings > Manage search engines. Then simply “ADD” a new search engine. 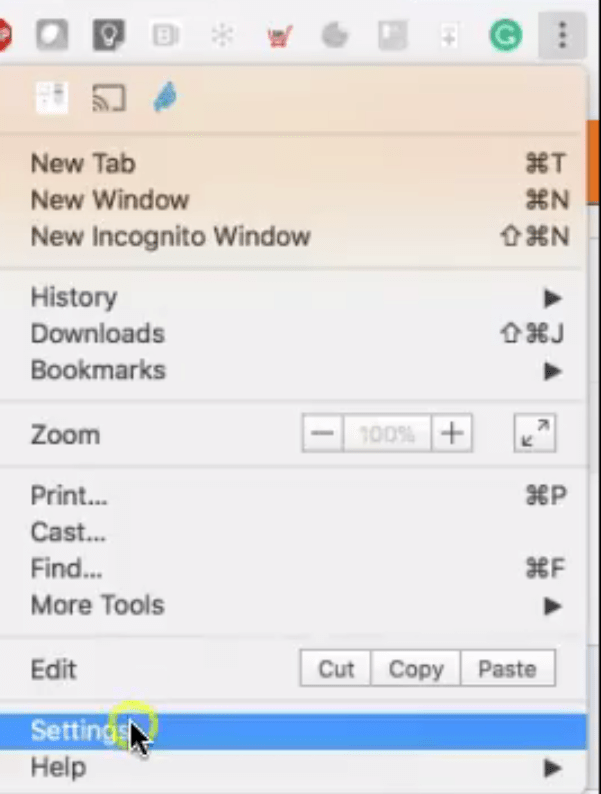 If you’re using Firefox, click > Options > Search. I’ve also setup “i” to take me to an issue and other shortcuts to take me to other admin pages. 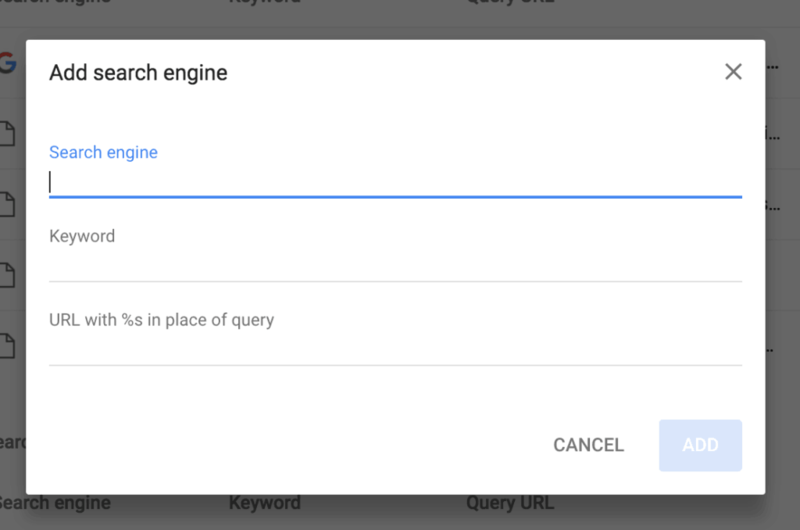 You can implement this same browser search trick with other applications and websites that have predictable search URL patterns. Ex: Confluence, Dictionary.com, Twitter, etc. Think about the areas in Jira you visit most and place direct links to them on your browser’s bookmarks bar. If you don’t know how to do this, it’s extremely easy. First, visit the page you would like to bookmark. 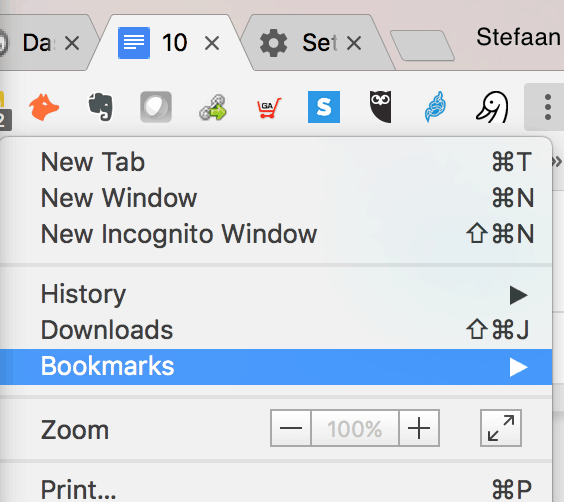 In Chrome, navigate to “Bookmarks” in your browser options at the top right. Then click “Bookmark This Page”. Finally name the bookmark and add it to your bookmark bar. As an end user, the three things I do most often are: visit my favorite “to do list” dashboard, search for issues, and check the status of issues I created for other teams (ex: an HR request, an IT help desk issue, etc.). Another way of increasing productivity in Jira is to lesson the use of the mouse or touchpad. We do this by making use of keyboard shortcuts to make common tasks easier. There are global, navigation, issue, and board shortcuts. You can access the list from the “Keyboard shortcuts” selection. It’s in the top navigation “Help” menu (Server) or in the bottom left sidebar (Cloud). You can also reach it by simply typing a question mark (“?”). My favorite shortcuts are “c” to create an issue and “/” to access the quick search. 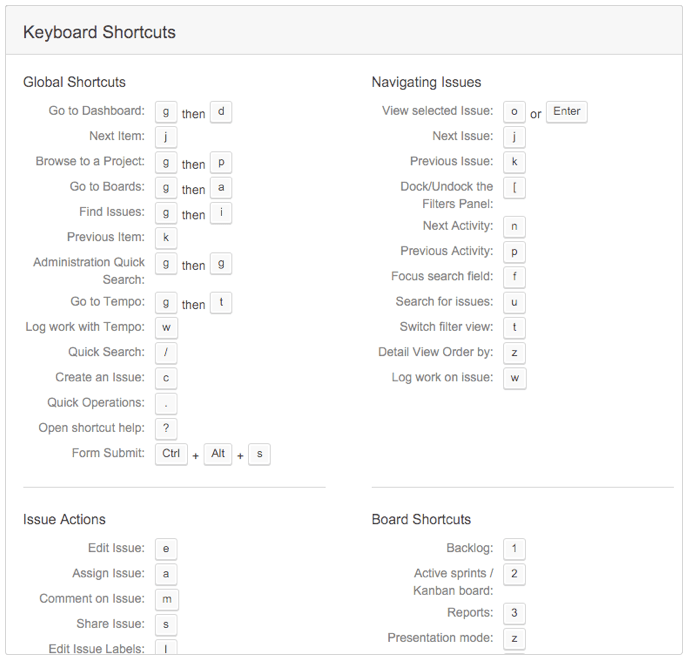 For more tips, read Atlassian’s keyboard shortcuts blog post. There are a number of personal profile settings you can optimize. Click on your user avatar and select “Profile” to access them. You can change the settings under “Preferences”. In the “Email type” field, change your email format from “Text” to “HTML”. Text format shows there’s a change but HTML format shows what changed! In the “Autowatch” field, select “Enabled” to be automatically added as a watcher on issues you create or comment on. 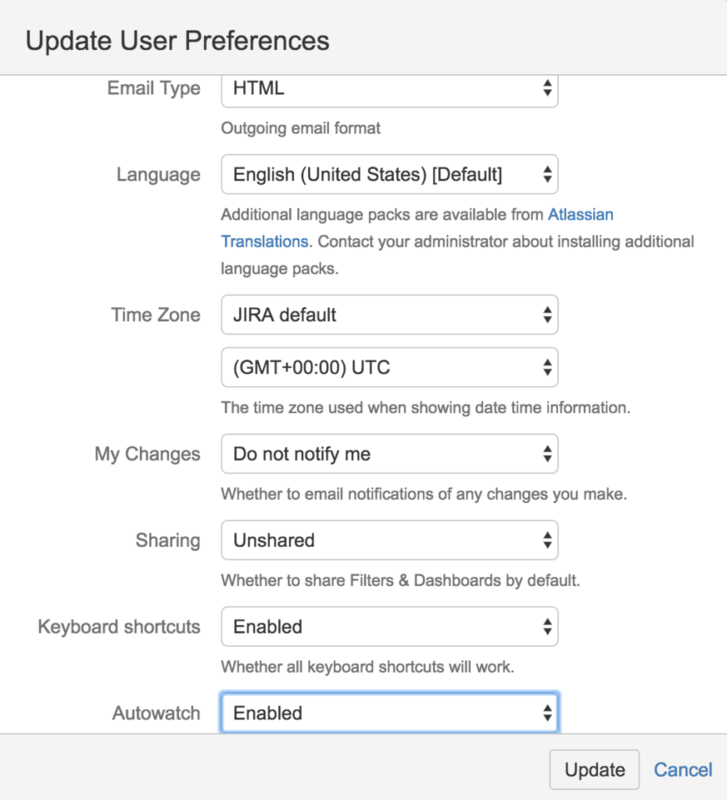 Tip: Jira administrators can set initial user preferences at: Admin > System > Default user preferences. Users can override these settings in their personal user profile. Does your team have a Confluence space, a Hipchat room, or another team hangout? 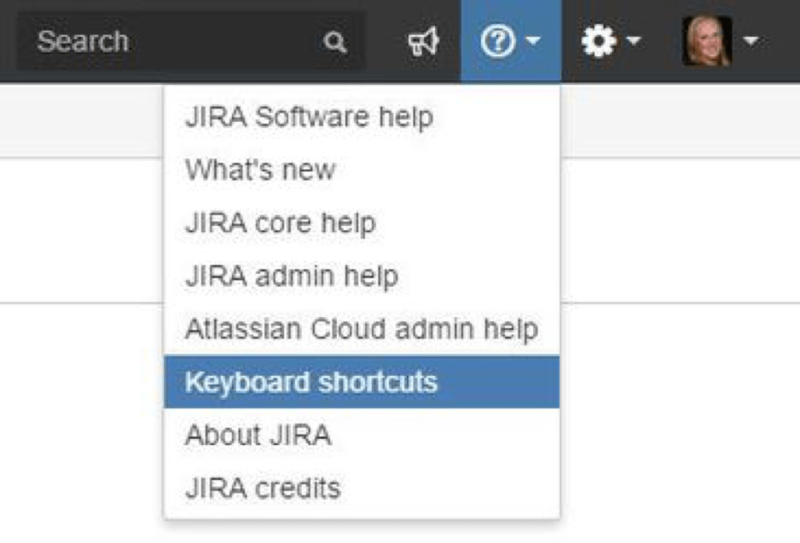 Did you know you could add them to your Jira menus? This can really help boost your productivity by helping you access all your tools. You can use the “Add link” (Server) or “Add item” (Cloud) option in the project’s left sidebar. If you’re a user, ask your Jira project-level administrator to add links to the side bar for you. Pro Tip: You can also add a team contact email address using “mailto:” in the “Web Address” field. Ex: mailto:team@domain.com. See screenshot. Does your company use other web-based tools? Ask your application-level administrator to add those links to the “Application Navigator” at: Admin > Applications > Application Navigator. Links to these locations are displayed under the menu. I use this feature for links that apply to all users, like the company intranet and our internal Jira help documentation. 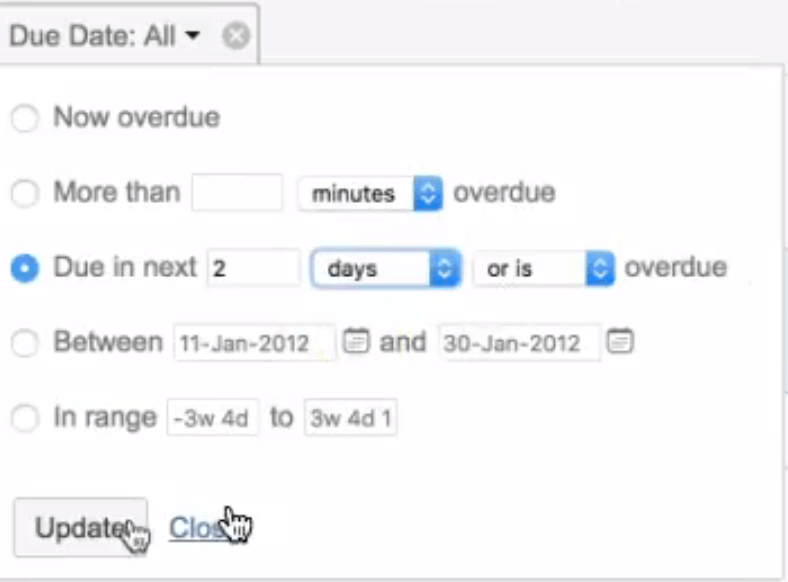 Connecting Jira to other applications gives you the ability to view lots of data in one place. For example, connect Jira to Hipchat to post a message any time a new issue is created. Connect Jira to Confluence to create a reciprocal link between issues and related pages. 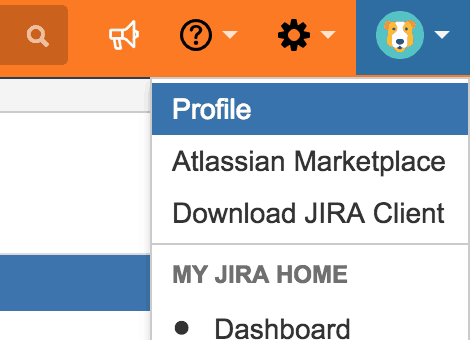 Ask your application-level administrators to link other Atlassian and internal applications to Jira from: Admin > Applications > Application Links. I recommend application-level admins have read-only access to the Jira database. Understanding how the data is structured will solve a lot of mysteries and is essential for any scheme cleanup or audit. There’s configuration information in the database that’s simply not available or easy to access in the Jira Administration Console. This is especially true for large instances. Maintenance or research often starts with a database query. This trick is meant for Application admins. If you’re an application admin you can quickly open the administration search box by typing “gg” on any Jira page. Type the first few letters of your search to show suggestions. Example: Typing “ban” will suggest the “Announcement Banner” page. Click the page name to go directly to the admin page. In the Jira Administration Console, launch this search box by clicking “Search Jira admin” in the area above the admin navigation. Who do you contact when you have a Jira question? Knowing whether to contact the project-level admin or the application-level admin will save time and get user questions resolved faster. Need an issue closed, a sprint started, or a component added? Those are project-level admin duties. 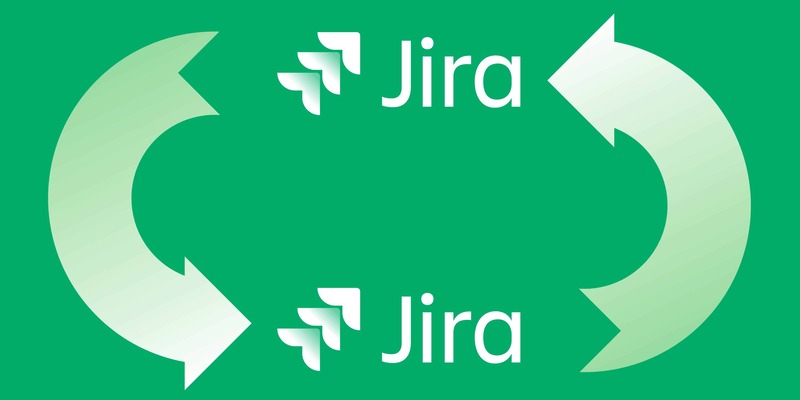 Need a new Jira project, an integration, or a change that impacts the application as a whole? That’s a job for the application-level admin. 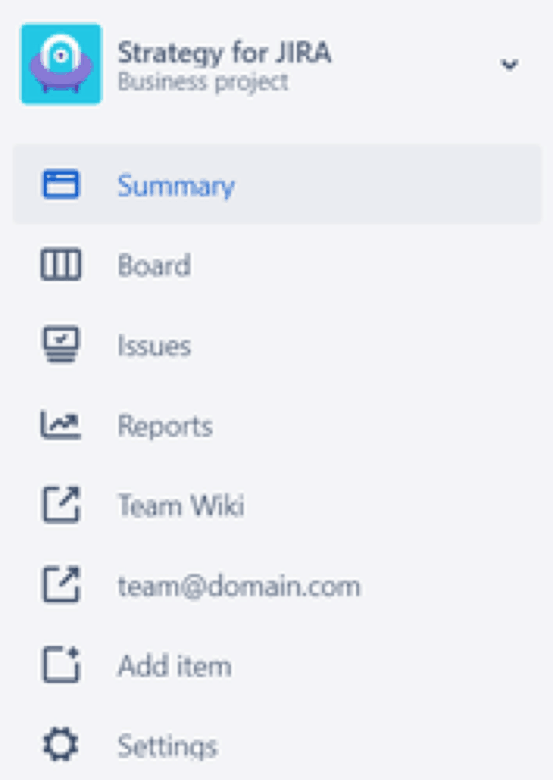 Application admins should delegate all project setting and individual issue questions to project admins. Tip: In each Jira project, use the project’s “Description” field to list the name of a single point of contact. This way, users always know who to contact first. Using the “Description” field is particularly helpful if the listed lead is a generic user or distribution list. See screenshot. The best way to increase your productivity is to learn from your peers and hear how they solved problems. Swap tips at your local Atlassian User Group meetings, in the online Atlassian Community, and at the annual Summit user conference. Find a user group near you (or start one) at aug.atlassian.com, use your Atlassian ID to login to community.atlassian.com, and add the next Summit to your training calendar. We rely on Jira to give us some structure in otherwise a chaotic build-up of tasks. But its flexibility does create a feature-rich environment where it is easy to get lost at times. Following these 10 tricks doesn’t just create order in Jira, but it can significantly increase your productivity. Next time you’re getting frustrated with Jira, Implement these tricks and you will be running through your tickets faster than ever before. What did you think of these 10 tricks? Did I miss anything? Let me know about your productivity tips and tricks in the comments below!